The exterior of the former Horner’s Corner. 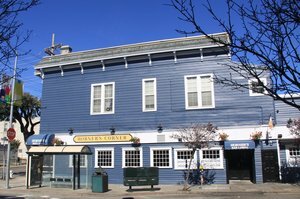 Yelp photo via Sandro T.
The former Horner’s Corner on Church Street is going to be transformed into ~HAMLET~, thanks to owner John Dampeer, who previously turned Joe’s 24th Street Café into Caskhouse. Noe Valley SF originally reported he was going to overhaul the space and install a new bar, flooring, and change the entire layout, and now SFoodie shares some additional details. There will be a full bar (with well-executed cocktails), craft beers, and quality wine selections. Caskhouse chef Alex Gutierrez will be helming the kitchen, which will be “a modern California-style eatery, with a combination of small plates and entrées.” Yeah, the entire pub atmosphere will be gone. There will be 49 seats, with room for 12-16 on the patio. Looks like it’s actually something for the neighborhood to look forward to this fall. 1199 Church St. at 24th St.
Harmonic Brewing. Photo by Michael David Rose Photography courtesy of UrbanDaddy. Beer is the word these days, and the craft brew craze continues with ~HARMONIC BREWING~, which UrbanDaddy reports is opening later this week in Dogpatch. The sudsy project is from owners Ed Gobbo and Jon Verna, who are brewing seasonal and experimental beers, in addition to a signature brew called the Rye Old-Fashioned Pale, a pale ale inspired by the classic cocktail. 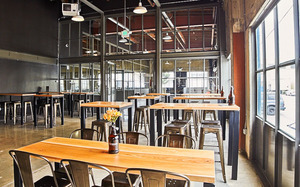 The space is in a former warehouse (this is Dogpatch, after all), with high ceilings, warm wood, big windows, and plenty of stools for enjoying your pint. Eventually, they’ll have 12 beers on tap, but for now there are only 4 while they ramp up operations. 1050 26th St. at Minnesota, 415-608-9032. 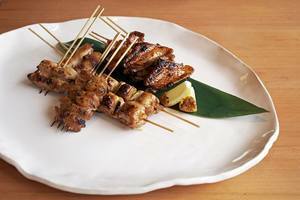 Robata from Pabu, included in their sake tasting classes. Photo from Facebook. Anyone who enjoys sake, or just wants to learn more about it, needs to meet sake sommelier Stuart Morris at ~PABU~. Starting on Saturday August 8th, he is going to be leading a monthly class about the history, art, craft, and brewing of sake. During the hour-long class, guests will taste different styles of sake and learn about pairing. The $75 price includes the sake tasting, a cheese plate, robata, oysters, and sweet miso octopus salad. 2pm-3pm. Future dates: September 12th, October 10th, November 14th, December 12th. 101 California St. at Front, 415-668-7228. Both locations of Dosa, ~DOSA ON FILLMORE~ and ~DOSA ON VALENCIA~, have launched a new late-night happy hour. You can order snacks like their awesome vada pav sliders, pakoras, and idli fries for $4-$9, plus specials on beer ($4), wine ($7), and a couple of $8 cocktails from the Spice Route cocktail menu. Regular happy hour is Mon-Thu 5pm-7pm; it kicks in again Mon-Thursday 9pm-11pm, Fri-Sat 9pm-12am. The next time you visit ~HAWKER FARE~ on Valencia, Troy Bayless and Christ Aivaliotis of Wizard Oil Co. have launched a new tropical cocktail menu featuring specialty concoctions and tributes to classic tiki. Upstairs in the Holy Mountain bar, you’ll also find a new menu that pays homage to James Bond (of course there is a Vesper on there). All cocktails are $12 each. Come by Fri-Sun 2:30pm-5pm for Tiki Hour, with half-priced bar bites like their blistered green beans, green papaya salad, and fried chicken. 680 Valencia St. at 18th St., 415-400-5699. Speaking of fun new cocktails, did you know that ~CENTRAL KITCHEN~ offers a swell Sunday brunch on their patio, complete with cocktails? It’s a fact. They’ve recently launched some new beverages, too, all named after local beaches. Keep in mind these are all lower-proof options, making them just right for a day in the sunshine. Check out the Stinson, with manzanilla sherry, grapefruit shrub, and lemon, or perhaps the Baker Beach is more your speed, with peach, cinnamon, and sparkling wine. For “dessert,” consider the Bodega Bay, with Death and Taxes black lager and coffee ice cream. Brunch is served Sundays from 10:30am-2pm.